Spicy fish curry / Meen mulaku curry - old method | Simple and Delicious ! 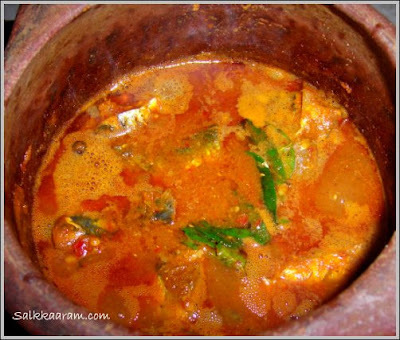 This is an old method of making fish curry, which is prepared grinding all the ingredients (spices) on a grinding stone / ammikkallu. This curry comes out as thick, so you can add more water to make it according to your taste. Roast red chillies and grind with garlic,small onions and add mashed tomatoes to it. Soak tamarind in little water for some time and take the extract. Mix this with turmeric and add to the ground paste to make a thick solution. Soak fish in this and cook. Remove from fire when it is done, add curry leaves and coconut oil. ( if you like kudam puli use it instead of tamarind).